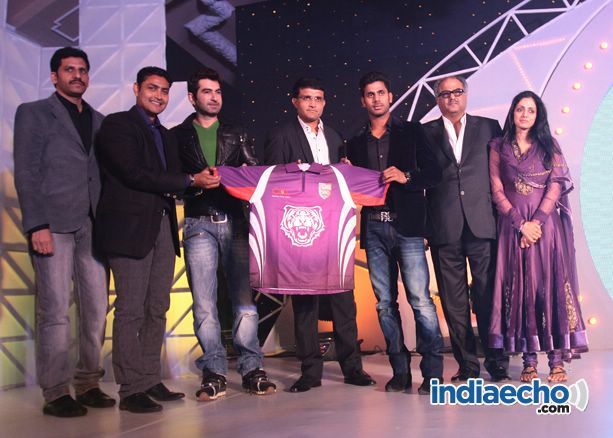 Bengal Tigers would be the new team to be included in the second season of the much extravagant Celebrity Cricket League (CCL). At the event Sridevi, Boney Kapoor and Sourav Ganguly unveiled the Team's logo and jersey. 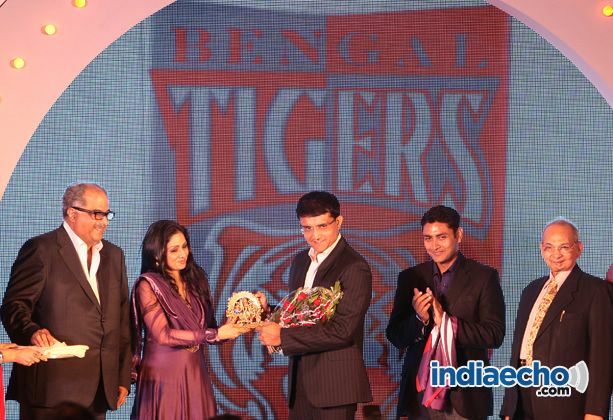 The Bengal Team is owned by Bengal Tigers Sporting Pvt Ltd, a newly formed company promoted by Boney Kapoor. Former Indian Captain and the prince of Kolkata Sourav Ganguly will be mentoring the team, while Bengali superstar Prosenjit will be the brand ambassador for the team. In the launch event it was announced that the coach of ‘Bengal Tigers’ is Sambaran Banerjee, Bengal’s Ranji winning captain and Cricketer Deep Das Gupta will act as an consultant advisor to the team. The Bengal team will have celebrities like Indranil Sengupta, Jishu Sengupta, Srijit, Soham and Jeet will be the team's captain. Also present at the event were Director Raj Kumar Santoshi, actor Payel Sarkar, Srabanti, Barkha Bisht Sengupta. 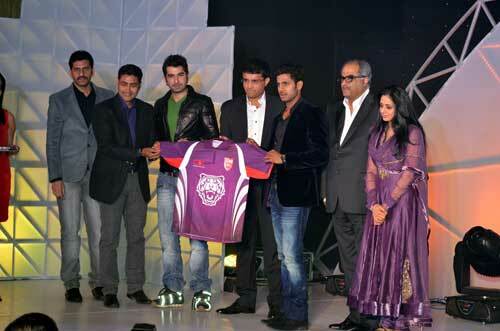 CCL Season 2 has yet another new team which is the ‘Kerala Strikers,’ owned by director Priyadarshan. The six teams from Telugu, Tamil, Kannada, Hindi, Bengali and Malayalam will play 15 league matches and finally the winning team would enter the 2 semi finals and then the final. The matches will be played in Kolkata, Hyderabad, Chennai, Bengaluru, Kochi, Dubai, Abu Dubai and Sharjah. The CCL matches are scheduled to begin from January 2012. 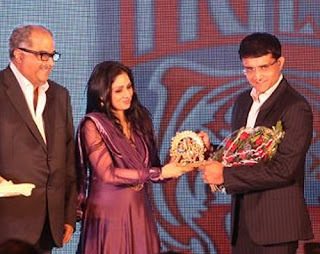 Kolkata, Nov 27 (IBNS): In season II of Celebrity Cricket League (CCL), new team ‘Bengal Tigers’ from Kolkata owned by Bollywood producer Boney Kapoor and his wife Sridevi was launched on Saturday. 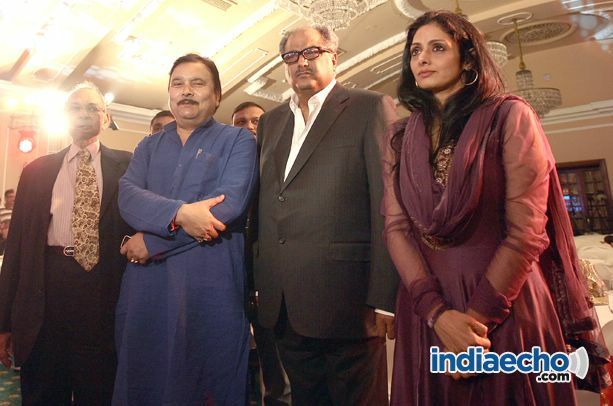 ‘Bengal Tigers’, the new star-studded team from Kolkata, is owned by Bengal Tigers Sporting Pvt Ltd, a newly formed company promoted by Boney Kapoor. “I began my professional career in Kolkata 30 years back. Kolkata has sipped into my blood,” added Bonny. With an increasing number of star cricketers, glamorous team supporters and cheering and enthusiastic spectators, Season II of Celebrity Cricket League is going to be a much bigger and more extravagant affair. 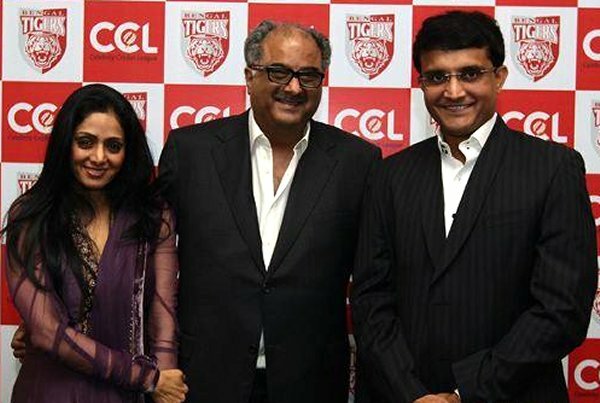 Former Indian Captain Sourav Ganguly will be mentoring the ‘tigers’ and Bengali superstar Prosenjit will be the brand ambassador for the team. The coach of ‘Bengal Tigers’ is Sambaran Banerjee, Bengal’s Ranji winning captain and Cricketer Deep Das Gupta will act as an consultant advisor to the team. 'Bengal Tigers' will have an exhilarating mix of crowd-pullers from the Bengali cinema and cricket as the team consists of Tollywood celebrities like Indranil Sengupta, Jishu Sengupta, Srijit, Soham and many more. Tollywood heartthrob Jeet is the captain of the Team. At the ceremony, the Team logo and jersey was unveiled. The evening added more colour with the presence of celebrities like Director Raj Kumar Santoshi, actor Payel Sarkar, Srabanti, Barkha Bisht Sengupta and many more on Saturday. The ever-young Sridevi was stunning in the evening in her purple dress. Along with Bengal Tigers, CCL Season II will see the inclusion of another new team, ‘Kerala Strikers,’ owned by director Priyadarshan. CCL is an idea to combine cricket and cinema to produce one sensational mixture of entertainment for audience. 'Bengal Tigers' will showcase their power play at five league matches during this season of CCL and it will be telecasted in 6 different channels. There will be six teams in total, that will comprise film stars from Telegu, Kannada, Tamil, Bengali, Malyalam and Bollywood. 15 league matches will be played altogether, 2 semi finals and 1 final. Matches will be played in Kolkata, Hyderabad, Chennai, Bengaluru, Kochi, Dubai, Abu Dubai and Sharjah. The action packed extravaganza is all set to begin in Jan 2012 to evoke a sky-high adrenaline rush and few nail-biting moments.